Why YOU should SPECIFY Aquron 300 Waterproofing Additive for Concrete? GREEN BUILDS - Simple to use & more environmentally friendly - Aquron 300 Waterproofing Additive for Concrete is Liquid and easier to handle than heavy powder bagged additives. AQURON 300 has no VOC or hazardous ingredients such as cacogenics like each other waterproofing products. Permanent Waterproofing - Aquron 300 Waterproofing Additive for Concrete produces a hydrogel and transforms moisture throughout porosity. Being inside the concrete, makes the AQURON waterproofing as permanent as the concrete itself. Internal Corrosion Protection – Aquron 300 Waterproofing Additive for Concrete is an internal and integral part of the concrete, allows AQURON to provide long-term protection. Aquron 300 Waterproofing Additive for Concrete extends life of structures with protection from Day one. Self-healing - Aquron 300 Waterproofing Additive for Concrete produces a hydrogel that is made up of CALCIUM SILICATES HYDRATES, if non-moving cracks occurs AQURON 300 will form more CSH Hydrogel and have a self healing effect in concrete. Improved Hydration & Curing - Although Aquron 300 Waterproofing Additive for Concrete is not a curing compound, by transforming moisture into a hydrogel the additive aids with the curing process to improve hydration. Aquron 300 Waterproofing Additive for concrete tends to have a Lower heat of hydration by transforming moisture into a hydrogel throughout the concrete porosity. Improves Achieved Strength - The concrete is made stronger, increases flexural strength and increases tensile strengths with use of AQURON 300 Waterproofing Additive for Concrete. These benefits are achieved through the improved concrete hydration. 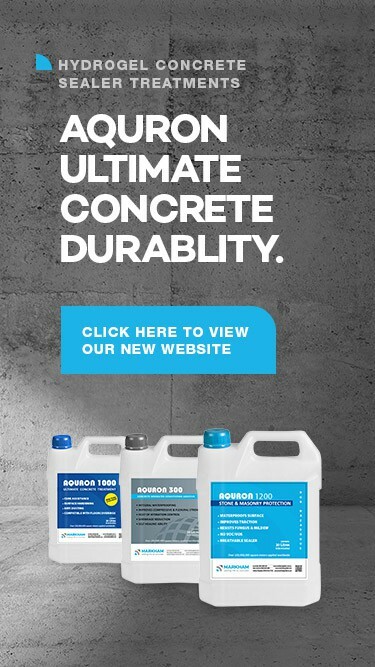 There are no other concrete waterproofing additives on the market that also increase strength. 3 n 1 Combo - AQURON 300 eliminates the cost and requirement for multiple additives to be used in conjunction with each other. For example: shrinkage reducing additive + waterproofing additive and then pump aid... with AQURON 300 you only need the one product which eliminates the number of suppliers, products and cost!